We now know the scale of the universe to within 1% accuracy. The results have been presented in an arxiv preprint. It isn’t yet peer reviewed, but it has been submitted to the Monthly Notice of Royal Astronomical Society, and I suspect it will be accepted soon. The data comes from the Baryon Oscillation Spectroscopic Survey (BOSS), which has measured the direction and redshift of about 1.2 million galaxies very precisely. The reason this is important is that it gives us a really good idea of the distribution of galaxies in our universe. The galaxies measured are not close ones. Their redshifts (known as z) are from 0.2 – 0.7, which means the light we observe has travelled for about 2.5 to 6.5 billion years. The galaxies are so distant that the answer to “how far away?” depends on what definition of distance you use. Regardless of which definition of distance you mean, the greater the z redshift, the greater the distance. So by measuring this redshift very precisely for more than a million galaxies we know how galaxies are distributed across billions of light years. This allows us to look at the way galaxies clump together. 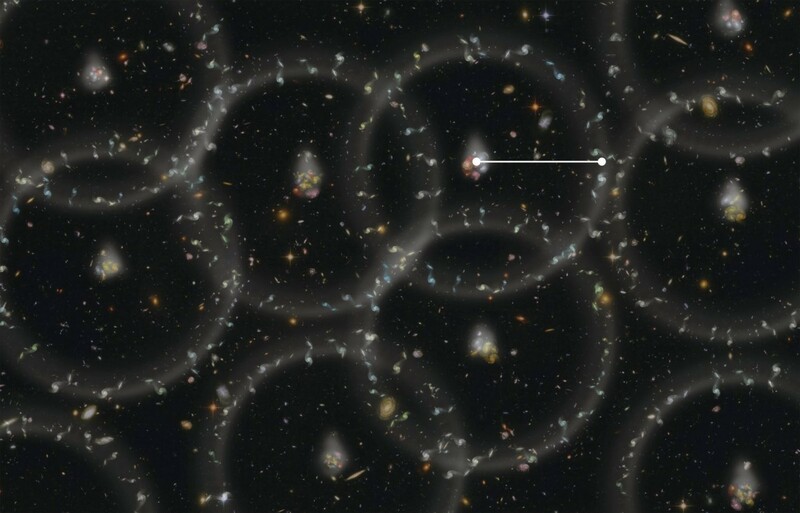 The distribution of galaxy clusters lets us determine what is known as Baryon Acoustic Oscillation (BAO). The basic idea of BAO is that small fluctuations in the distribution of matter and energy in the very early universe cause galaxies to cluster in a particular way. These are known as baryon acoustic oscillations, because they are variations (oscillations in space) of galaxies (baryonic matter). The “acoustic” part of the term means they have a sound-like quality to them, not that they have anything to do with sound as we usually mean. You can get an idea of this if you think of how sound waves affect air molecules. The sound waves cause the air molecules to be bunched together a bit in some regions (higher pressure), and spread apart more in others (lower pressure). As a result, sound waves create a variation of clustered air molecules. The clumping of air molecules depends on the speed of the sound waves in air. In the same way, the distribution of galaxy clusters depends depends on the scale of the cosmic ripples, somewhat like the artistic image below. These fluctuations depend on the rate at which the universe expands, which depends on the amount of dark energy in the universe. So making such precise measurements of galaxies allows us to determine the amount of dark energy in the universe. From this survey, the present scale for clumping (known as the standard ruler) is about 490 million light years. This puts dark energy at about 69.2% of the universe. We don’t yet know what dark energy is, but we now have a better measure of its effects.